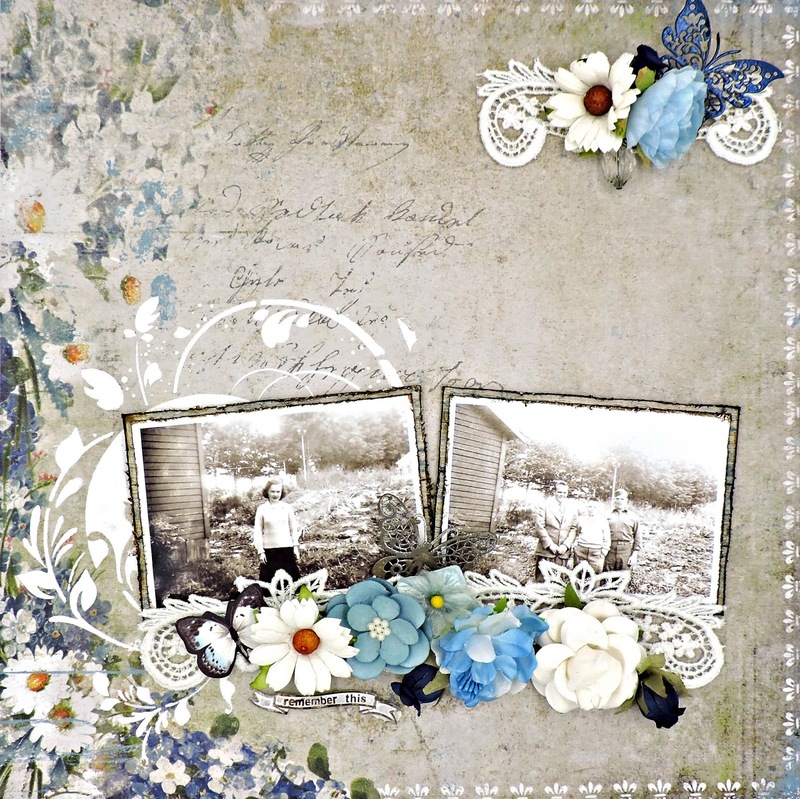 The Tranquility Collection by Blue Fern Studios is perfect for vintage photos and the August 2016 sketch from Swirlydoos is perfect for these images and I've used the Calm pattern paper as a base for my layout. I decided to try using the Ranger Distress Grit Paste that came in the August Mediums Add-On with one of my favorite stencils (Prima #560898) to create a background and I'm so pleased with the results - a clear white with a lot of texture. The Mediums Kit also came with several jars of BFS embossing powders, in Mushroom and In the Navy. I've used these on my chipboard butterflies from Bo Bunny, part of the Embellishment Add-On. Once all was prepped and dried, I matted my photos with some scraps before adhering them to the base. Next, I took some lace that I've had for quite a while and used it to create a border on the bottom of the images, as well as a strip in the upper corner. Also from the collection are a crystal dangle and the Melissa Frances resin banner that has become my title. The woman in the first photo is my mother; the men in the second are three of her four brothers, my Uncles Vinny, Pat and Paul. They were standing in my grandmother's back yard behind the garage and in front of her rock garden. The back of the photos were stamped "March 1943", but the trees in the background are too full for a March in western New York; in fact, they wouldn't have started to bud yet. Judging from the sweaters that my mother and Uncle Pat were wearing, I'm guessing that they were taken in October, 1942. Big Congratulations Peggy for being featured on Blue Fern Studios blog!! This beautiful layout deserved to be show cased!